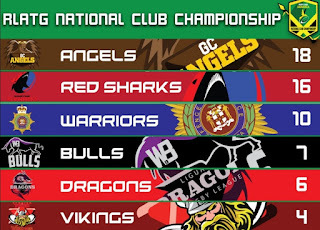 The home stretch has now been outlined, 3 games of the regular season remaining and the finals quickly looming. The Sharks out shinning the Warriors, Spanish Town shocking the Bulls with a draw and GC continuing their unbeaten run with a demolition job on the Liguanea Dragons. Duhaney Park made sure that they stayed hot on the heels of the GC Angels with a 28-12 win over the JDF Warriors, the Red Sharks avenging the shock draw from round against JDF with a convincing statement of intent. Shane Brown would improve his growing tally for the Warriors, joining him on the scoresheet was Kadion Smith, Nickolai Kennedy as reliable with the boot as ever and converting both of the JDF's tries. The Red Sharks proving to have more than enough fire power to see off their opponents, Andre McFarlane, Marvin Thompson, Mark Edwards and Andrew Simpson all adding to the scoreboard, 3 kicks from Ryan Grant kicking 3 goals and Simpson also knocking one over the sticks, the Red Sharks able to see off the Warriors and put their hopes of making the top 2 a real doubt. The Red Sharks now 6 points clear of the Warriors off the back of their 28-12 win. Spanish Town stole their second draw of the season after shocking the Bulls in a 28-28 draw. Washington were the out and out favourites for this game, and with good reason, the Vikings showing that they should no be underestimated in a thrilling game, unfortuantely for the Bulls their kicking game letting them down. .Devon Thomas scoring twice for the Vikings; Raheem Sweeney, Rajiv Haughton and Odayne Hanson making up the other 3 of the Vikings 5 tries. Shane Brown converting 2, Neville Linch and Haughton kicking one each to give the Vikings an 80% conversion rate, those kicks salvaging the points for Washington. The Bulls scoring 6 tries but only able to convert 2, a short fall that would ultimately cost them victory on Saturday; O'Niel Thomas, Daniel Morrison, Akel Johnson, Kishony Campbell , Shamoy Stewart and Rashaad Gayle all making the line, Kishony Campbell converting twice for the Bulls to make up their 28 points. 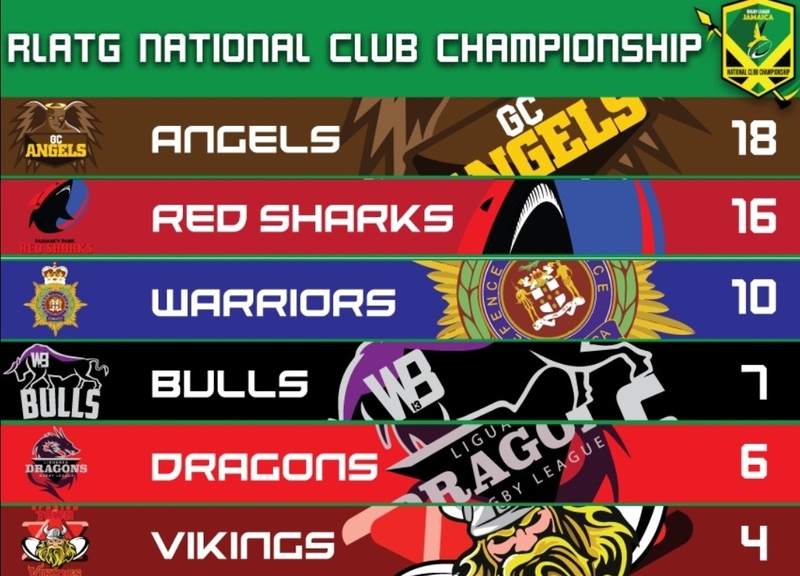 The Angels continued their fine run of form at the top of Jamaica's elite division of Rugby League, the Angels still holding a 2 point lead over the Duhaney Park Red Sharks after their emphatic 50-4 win over the Liguanea Dragons. The Dragons points difference and morale taking a real hammering after this loss, Adrian Hall the only player to make the scoresheet for Liguanea. It was a case of the usual suspects on the Angels scoresheet, Keta Bryan scoring twice for GC, Dondre Haughton, Shemar Henry and Stephen Scott all going over once, while a rampaging Antonio Baker reclaimed top spot on the try scoring charts, crossing 4 times to take his total to 12 tries in 7 games for the GC everpresent, Adrian Brown kicking 2 goals and Stephen Scott kicking 5 to give GC a 50-4 win.